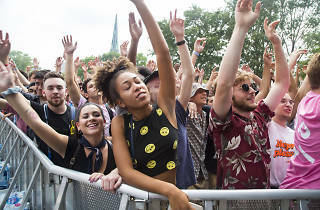 Cooler temperatures and cloudy skies greeted attendees on Sunday at Pitchfork Music Festival. After another day packed with bands (and one unfortunate cancellation), the crowd thinned out as the end of the day approached and weary fest-goers finally threw in the towel after a long weekend (or just departed in time to catch the premiere of Game of Thrones). 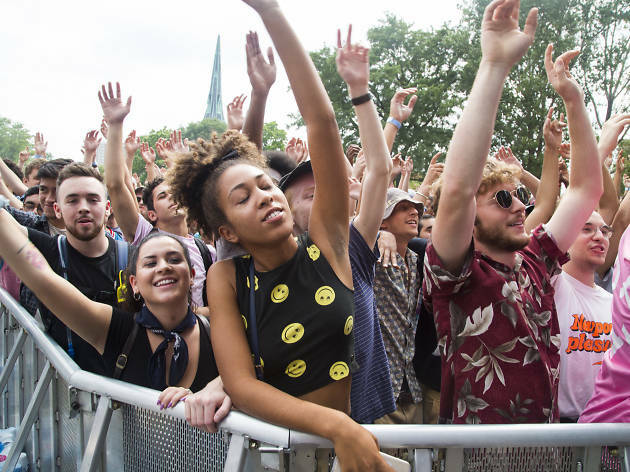 We stuck it out to the bittersweet end of the fest—take a look at our five favorite things from the final day of Pitchfork Music Festival 2017. A handful of acts brought along back-up dancers to their sets at Pitchfork this weekend, but no one approached the emotive, elegant and set-spanning choreography of Solange's closing set. Dressed in white and flanked by pillars and a pyramid, the singer-songwriter and her bandmates began their performance with a trio of songs from A Seat at the Table, made even more graceful by the entire ensemble's flowing, synchronized movements. Much like her sister, Solange's voice loses none of its power in a live setting, easily replicating the complex harmonies that populate her records.